So fellow travelers, I came across this wonderful painting called Just The Two of Us by artist Joe Hawthorn. Dogs are frequent characters in his work and naturally, as a volunteer dog walker and rescue dog “mom” those always catch my eye. “JUST THE TWO OF US…..As the song goes….”just the two of us against the world”…..There are times in life when we feel we are up against it, perhaps at times our fears are found-less, perhaps not. But it’s in these times we turn to our partners, our soul-mates for support and understanding, to walk through the harder times with. Coming off a few days riding the rough waters of doubt, his words struck a chord and the colorful image hit my retinas with a burst of energy which went straight to my heart, sparking a creative ember into a flame. I clicked “like” and started typing a comment. As it grew in length and detail, I realized I had more to say than a simple comment. So I requested permission to use his artwork in this post and started writing. Sunday’s at the Rescue is a blog series I have been mulling over since I resumed my regular volunteer shift at Helping Hounds Dog Rescue. “Sunday” is the name of a young dog that came in around that time. No matter how long I am away from the dogs, I always find myself coming back. It requires careful balance of emotions to continue working in the rescue arena without burning out. It’s easy to lose perspective, something I wrote about a while back. 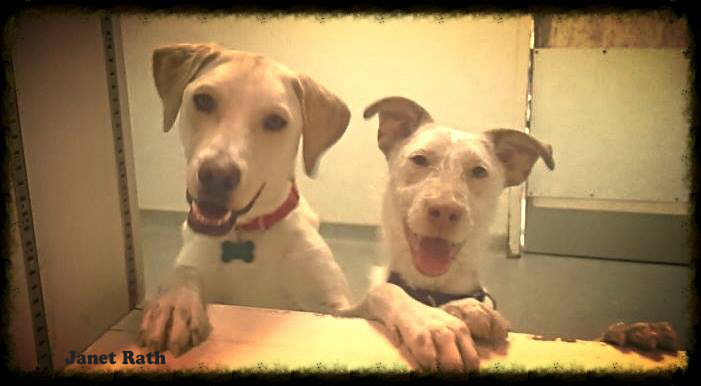 One of the many joys I get to experience when volunteering is watching the dogs who come in form “friendships.” For some it’s the first opportunity for socialization they have had in their young lives, especially the ones rescued from the streets. It also prepares them for becoming part of a family pack, as many of our adopters already have a dog or two at home, quite frequently an alum from HHDR. 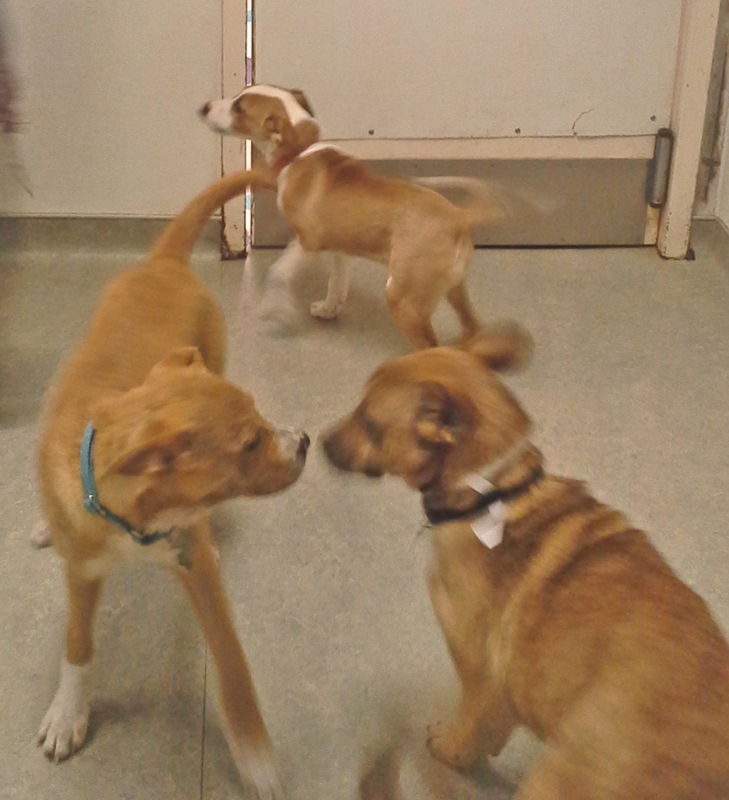 When the dogs first arrive at the rescue, they are often scared and disoriented. Whatever circumstances they are coming from, stray or surrender, local or transport from another area the rescue is an unfamiliar, sometimes chaotic place. The day a transport comes in we might take in thirty to forty new dogs and have upwards of fifty total with current dogs on hand. There are a lot of hungry mouths to feed, a lot of paws to get walking and plenty of crates to clean, especially if there are several puppies in house. So as Joe says, in times like these it is good to have a friend. Last month while working one of my usual evening shifts, I had to opportunity to snap some photos of the dogs hanging out in the playroom which doubles as a meet and greet area during adoption hours. It was bitter cold and sleeting that evening, so outdoor walks were limited to quick trots around the parking lot to get their “business” done and head back inside. 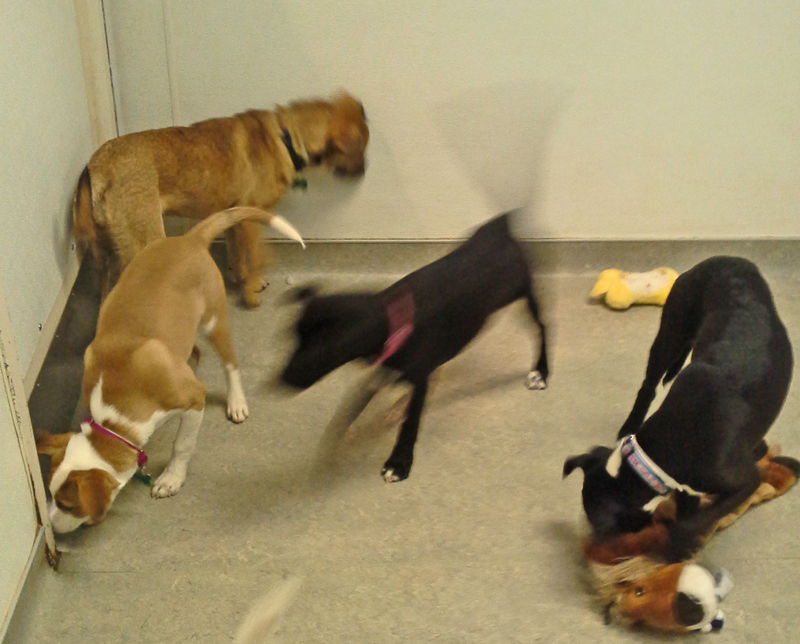 Many of the dogs in this group had arrived earlier that weekend. It was uplifting to see the transformation some of them had made. Linden came off transport so scared one of the volunteers sat with him wrapped in a blanket for about an hour until he stopped shaking and settled in. It didn’t take long for him to open up and while still shy, he was always happy to play with his friends. At first, the dogs don’t interact, some go straight to the door wanting to go back to the safety of their soft warm beds. 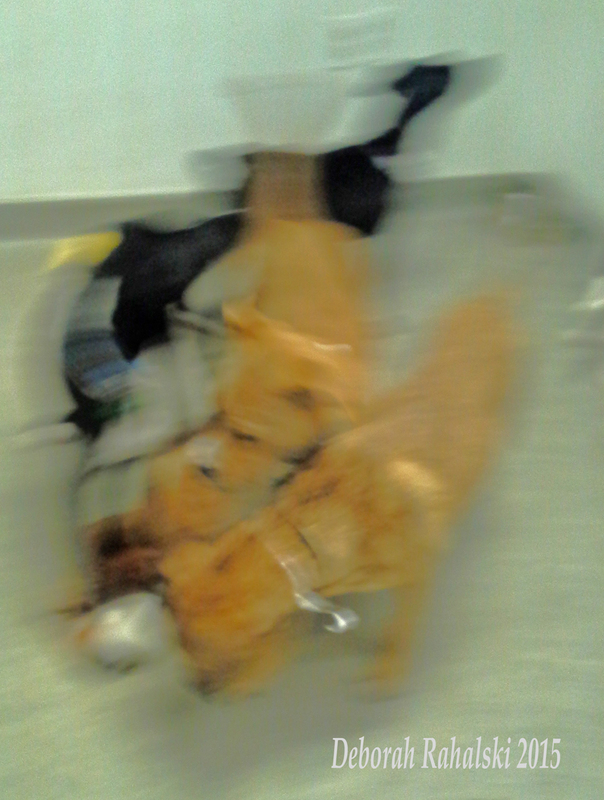 Others go straight for the toys…..
and then suddenly its full on pup party time, a blur of fur and fun. After that it takes patience to get good shots like this one our vet tech Janet snapped of Bo and Billie coming to the “self-serve” window looking for treats. We volunteers fall in love regularly, we all have our favorites, the ones we cherish walking and sitting on the cuddle couch with, soaking up a little “two of us” time. It’s a feeling outmatched only by the joy of being there the day that dog picks their new family whether it’s a single parent or a whole ready made “pack” with Mom, Dad and both two and four legged kids. Seeing them leap off the couch after the obligatory adoption photo and head out to a new life, tail wagging like crazy, yeah sure, your eyes sting a little from the pull on the heartstrings. I wouldn’t have it any other way. 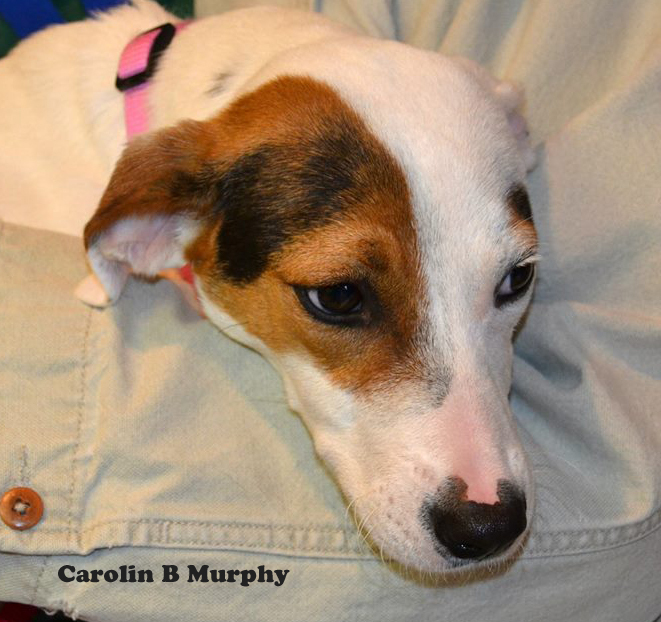 Special thanks to my rescue friends Janet Rath and Carolin Booth Murphy for the use of their photos. Joe Hawthorn’s art work is posted with permission. 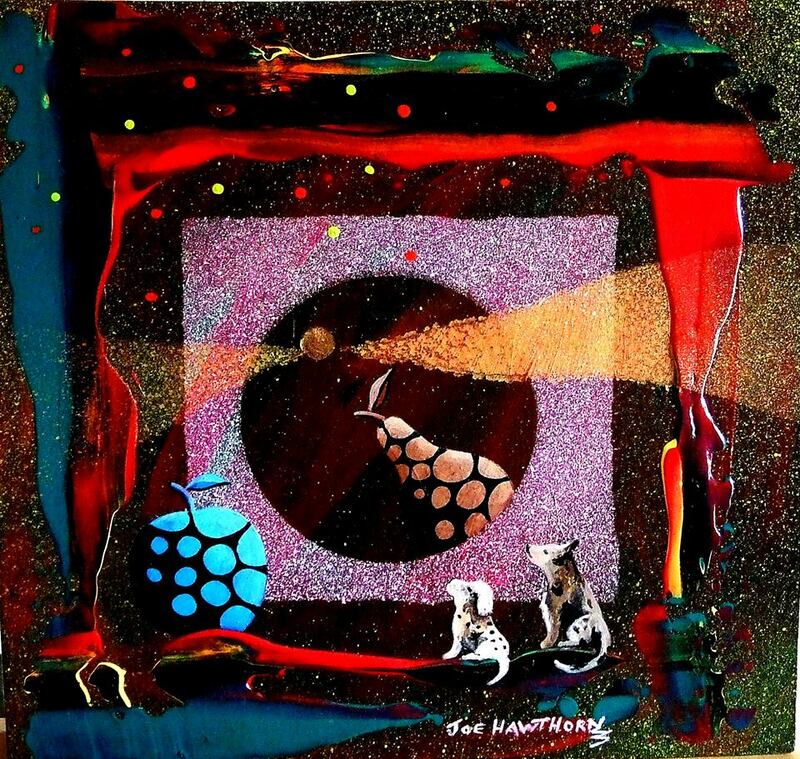 He is a fellow member of the CGBF and his colorful, whimsical stories on canvas intrigue me. He also happens to have an affinity for Jonathan Livingston Seagull (Richard Bach, 1970) and frequently incorporates the winged hero of my teens in his paintings.